Activities to measure area of objects, or the amount of two-dimensional space which they cover. Teacher Notes: Terminology for usage of metric units, for both written and spoken form. Introduction to area. Using informal units to explore the idea of area. Introduction to the square metre. Activity involves creating square metres for classroom use. Introduction to the square centimetre. Activity involves creating square centimetres for classroom use. Discriminating between measures of area and measures of length. Involves hands on activities. Find the area of a rectangle using metric measures. 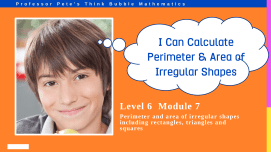 Find the area of an irregular shape made up of two rectangles using metric measures.